If anyone at UBC has had to hit the ground running, it’s Sonya Boyce and Shilo St. Cyr. Not only are they just six months into their respective roles as directors of the new Vancouver and Okanagan Sexual Violence Prevention and Response Offices, but they are building a team of staff, working on training and awareness campaigns, and providing supports and referrals to students, staff and faculty affected by sexual violence. “People are reaching out to our office for all sorts of different reasons,” Sonya reflects. “Faculty are reaching out to consult around how to make their departments safer and how to respond to disclosures. Survivors are reaching out because they need support, they want information around their reporting options, they want accompaniment to hospital or police.” She stresses that it doesn’t matter when in a person’s history they may have experienced sexual violence—if they are at UBC and need help, her office will provide it. 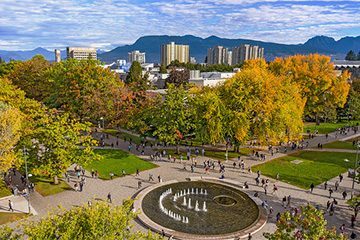 The creation of the Vancouver and Okanagan SVPR offices came out of UBC’s new Sexual Assault and Other Sexual Misconduct policy, which was approved by the Board of Governors a year ago this month. Acting on feedback received while drafting the policy, UBC committed to establishing a single point of contact and liaison for students, faculty and staff who have experienced sexual assault, sexual harassment, or any other form of sexual violence or misconduct. In addition, the SVPR offices also work on prevention efforts across the university. No doubt it’s a big job, but Sonya and Shilo have years of experience working in the field. Sonya joined UBC after 21 years at the Surrey Women’s Centre, where she spent her first eight years counselling survivors of gender-based violence before assuming the position of Executive Director. Shilo moved to her position on the Okanagan campus after being a Manager of the AMS Sexual Assault Support Centre. Prior to that she worked with the Elizabeth Fry Society, supervising programs that included a low-barrier shelter and treatment programs. The Sexual Violence Prevention and Response Office for Vancouver opened in October 2017; the Okanagan Office opened in December 2017. Myrna McCallum was appointed as the Independent Director of Investigations for Policy 131 and Policy 3 for the Vancouver and the Okanagan campuses. The Vancouver SVPR office will eventually include two educators; two advisors; a dedicated resource staff person for Indigenous students, staff and faculty; and a sexual violence survivor rights advisor. The Okanagan SVPR office will soon have two staff, including its director and a support worker. The SVPR offices provide training and education to students, staff and faculty, in addition to support for survivors, their friends, family and community. The SVPR offices are a key part of UBC’s Policy on Sexual Assault and Other Sexual Misconduct, which was approved by the Board of Governors April 13, 2017 and came into effect May 18, 2017.